Each year we bring volunteers with us to the Wilderness Risk Management Conference. 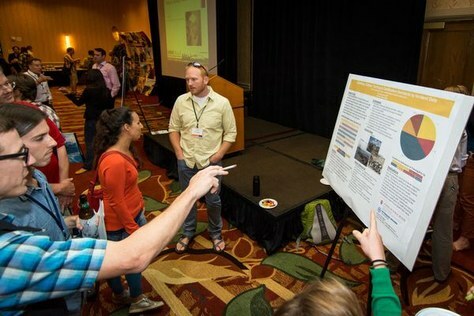 Learn more information about the conference and apply for a scholarship to attend. Managing risks as an organization devoted to outdoor adventure and exploration is a conundrum. To fulfill our mission of Explore, Learn, Conserve, we must take risks. But what are the right risks to take, how do we measure those risks, and what happens if we take risks that have unintended consequences? Safety is a value of The Mountaineers and is deeply woven into our policies, training, and organizational culture. To be “safe” is to be “free from harm or risk,” (Webster) which is, technically, impossible. Rather than trying to operate completely free from risk, it’s better to pursue the right kinds of risks – we might call these “beneficial risks.” What are the beneficial risks inherent to pursuing our mission? And how do we run programs, and make decisions as an organization, that take the right kind of beneficial risks? The Wilderness Risk Management Conference has been exploring answers to these questions for over two decades. The conference is an annual gathering of outdoor professionals, representing a true convergence of expertise from various facets of risk management: practitioners, administrators, insurance providers, wilderness medical professionals, equipment manufacturers, and attorneys. The spirit of the conference is captured in the WRMC Tenets and can be summarized as: a community of outdoor professionals sharing practices, learning, and experience in a collaborative environment. WRMC is also designed to help you learn about managing two other types of risk: organizational risk (things that threaten your business) and emotional risk (the emotional well-being of participants in outdoor adventures). To that effect, keynote speaker Whitney Tome (Executive Director of the environmental diversity initiative, Green 2.0) will speak on Emotional Risk: Inclusion & Belonging in the Wilderness Experience. The WRMC is a melting pot of expertise, a junction where industry leaders converge. If you want to learn more about changing views on wilderness medical practices, recent developments in legal cases pertaining to the outdoors, explore how technology can be used to mitigate risk, collaborate with others on fostering a culture of incident reporting, or discover better ways to design and deliver trainings, the WRMC provides you with all of these opportunities. Thirty new speakers are presenting at this year’s conference, bringing a lot of fresh new insight and perspective, to augment the returning speakers and the established core curriculum. A full schedule and descriptions of the presentations can be found here. Attend through a scholarship provided by The Mountaineers! We have TWO scholarships to offer this year, so if interested please fill out our application process here. Mountaineers Climbing Education Manager Steve Smith is a member of the WRMC Education Committee and can answer any questions you may have about the conference, or how attending might benefit you, your branch, and the organization overall. Contact Steve at steves@mountaineers.org.